Technology giant Google launched the creation of a nanoparticle platform at The Wall Street Journals WSJD Live conference on October 28, 2014. This proclamation expands Googles portfolio of connected technologies, which includes self-driving cars, high-altitude balloons that deliver Internet connectivity, and contact lenses that measure glucose in diabetes patients. Once entirely developed, Googles nanoparticle platform intends to continuously monitor health using ingestible pills. The pills are packed with magnetic particles that identify malignant cells in the bloodstream, and this information is subsequently transmitted to a wearable device via Bluetooth. 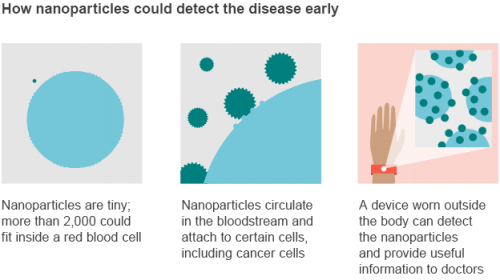 Google has identified cancer as the initial disease target for the platform, though it could also be used to early monitor and detect risk factors for health or kidney diseases. Commercialization, however, is many years  though not decades  away. Andrew Conrad, head of life sciences at Google[x], indicated that the company has no interest in leveraging collected data for commercial use. Google will not collect or store medical data. Instead, it will license the technology to others for information and security concerns. Nonetheless, privacy remains a concern for consumers, given existing uncertainty on the amount of data Google has on the individual. The Vitality Institute is working in partnership with the Institute of Medicine (IOM) to convene a workshop on the ethical, legal, and social challenges of personalized health technology to overcome data challenges. This is an output of the Vitality Institutes Commission on Health Promotion and the Prevention of Chronic Disease in Working-Age Americans. How does your organization use big data to advance health? Have you encountered any ethical, legal, or social challenges? We want to hear from you! Please tweet @VitalityInst or @gchristie34.